I love The Beatles and I love nonsense so this was a perfect match. When you feel you've been thinking too much for one day this is the book to read, it is just pure fun. The little short stories just make you giggle even if you're one of those people who never laughs when reading. 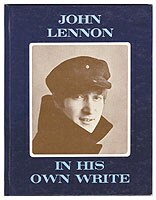 This book also makes John Lennon seem more human since he has become this legend you get to see this silly but still genius side to him. Just a warning don't try making sense of this book it will just give you a headache just read it for kicks. To quote dear Mr.Lennon "this correction of short writty is the most wonderfoul larf I've ever ready." I was bored on the 9th of Octover 1940 when, I believe, the Nasties were still booming us led by Madalf Heatlump (Who had only one). Anyway, they didn't get me. I attended to varicous schools in Liddypol. And still didn't pass-much to my Aunties supplies. As a memebr of the most publified Beatles me and (P, G, and R's) records might seem funnier to some of you than this book, but as far as I'm conceived this correction of short writty is the most wonderfoul larf I've ever ready. Because we are putting you to sleep at three of the clock, Nigel. "There was no reason for Michael to be sad that morning, (the little wretch): everyone liked him, (the scab). He'd had a hard day's night that day, for Michael was a Cocky Watchtower. His wife Bernie, who was well controlled, had wrabbed his norman lunch but he was still sad. It was strange for a man who have everything and a wife to boot. At 4 o'clock whne his fire was burking bridelly a Poleaseman had clubbed in to parse the time around. 'Goddeven Michael,' the Poleaseman speeg, but Michael did not answer for he was debb and duff and could not speeg . . ."
There were no flies on Frank that morning - after all why not? He was a responsible citizen with a wife and child, wasn't he? It was a typical Frank morning and with an agility that defies description he leapt into the bathroom onto the scales. To his great harold he discovered he was twelve inches more tall heavy! He couldn't believe it and his blood raised to his head, causing a mighty red colouring. He journeyed downstairs crestfallen and defective -- a great wait on his boulders -- not even his wife's battered face could raise a smile on poor Frank's head -- who as you know had no flies on him. His wife, a former beauty queer, regarded him with a strange but burly look. 'What ails thee, Frank? she asked stretching her prune. 'You look dejected if not informal,' she addled. Frank had to het his own breakfast that morning and also on the following mornings. Two, (or was it three?) weeks later Frank awake again to find that there were still no flies on him. He gathered her in a small sack (for she was only four foot three) and headed for her rightful home. Frank knocked on the door of his wife's mothers house. She opened the door. 'I've brought Marian home, Mrs. Sutherskill' (he could never call her Mum). He opened the sack and placed Marian on the doorstep. 'I'm not having all those flies in my home,' shouted Mrs. Sutherskill (who was very houseproud), shutting the door. 'She could have at least offered me a cup of tea,' thought Frank lifting the problem back on his boulders. I'm such a humble Joe. It was little Bobby's birthmark today and he got a surprise. His very fist was lopped off, (The War) and he got a birthday hook! All his life Bobby had wanted his very own hook; and now on his 39th birthday his pwayers had been answered. The only trouble was they had send him a left hook and ebry dobby knows that it was Bobby's right fist that was missing as it were. What to do was not thee only problem: Anyway he jopped off his lest hand and it fitted like a glove. Maybe next year he will get a right hook, who knows? To Clive Barrow it was just an ordinary day nothing unusual or strange about it, everything quite navel, nothing outstandley, just another day but to Roger it was something special, a day amongst days ... a red lettuce day ... because Roger was getting married and as he dressed that morning he thought about the gay batchelor soups he'd had with all his pals. And Clive said nothing. To Roger everything was different, wasn't this the day his Mother had told his about, in his best suit and all that, grimming and shakeing hands, people tying boots and ricebudda on his car. To have and to harm ... til death duty part ... he knew it all off by hertz. Clive Barrow seemed oblivious. Roger could visualize Anne in her flowing weddy drag, being wheeled up the aisle, smiling a blessing. He had butterfiels in his stomarce as he fastened his bough tie and brushed his hairs. 'I hope I'm doing the right thing' he thought looking in the mirror, 'Am I good enough for her?' Roger need not have worried because he was 'Should I have flowers all round the spokes?' said Anne polishing her foot rest. 'Or should I keep it syble?' she continued looking down on her grain haired Mother. 'Does it really matter?' repaid her Mother wearily wiping her sign. 'He won't be looking at your spokes anyway.' Anne smiled the smile of someone who's seen a few laughs. Then luckily Anne's father came home from sea and cancelled the husband. to find such wonderous voice. I hear but I have no choice. 'I know you hiddy by this tree'. But still she won't come out. got up - and flew away.